Effective Implementation in Practice: Integrating Public Policy and Management presents an instrumental approach to implementation analysis. By spanningpolicy fields, organizations, and frontline conditions in implementation systems, this book provides a robust foundation for policy makers, public and nonprofit managers and leaders. Detailed case studies enable readers to identify key intervention points, become more strategic, and improve outcomes. The engaging style and specific examples provide a bridge to practice, while diagrams, worksheets, and other tools included in the appendix help managers apply these ideas to team meetings, operational planning, and program assessment and refinement. Policy and program implementation is fraught with challenges as public and nonprofit leaders juggle organizational missions and stakeholder expectations while managing policy and program impact and effectiveness. Using their own experience in practice, teaching, and research, the authors empower policy and program implementers to recognize their essential roles within the workplace and help them cultivate the analytical and social skills necessary to change. The integration of policy and management mindsets gives readers an insightful yet accessible understanding of implementation, allowing them to achieve the potent results desired by the public. 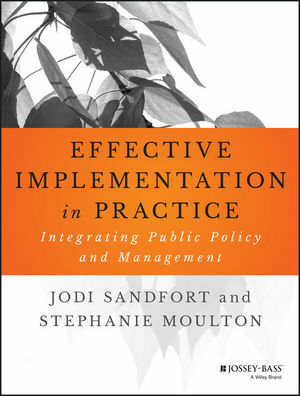 For those in senior positions at federal agencies to local staff at nonprofit organizations, Effective Implementation in Practice: Integrating Public Policy and Management provides an invaluable one-stop resource. Jodi Sandfort is Associate Professor at the University of Minnesota and Chair of the school's Leadership & Management program, providing oversight and strategic direction to the Public & Nonprofit Leadership Center and the Center for Integrative leadership. She is the author of numerous academic articles, book chapters, and reports for policymakers and practitioners about nonprofit management, social welfare system design, organizational effectiveness, early childhood education, welfare reform, and research methodology. Stephanie Moulton is Associate Professor at The Ohio State University's John Glenn School of Public Affairs. Moulton's research, teaching, and service combine policy and management, with a focus on the implementation and evaluation of housing policies and programs, and cross-sector determinants of public outcomes.